Flitcham Hall is the ultimate private country house retreat, with an outdoor heated swimming pool and a tennis court, hidden away on the royal Sandringham Estate reached by a long private driveway. We are delighted to offer guests the opportunity to stay in this gorgeous house during the summer holidays, Flitcham Hall is a fine period property full of character with an old world charm, being lovingly furnished in a relaxed contemporary style for use as a family second home by its interior designer owner. It's perfect for large groups of family and friends with several reception rooms and six generously proportioned bedrooms, within attractive well-maintained grounds which are completely private and have lovely uninterrupted rural views. 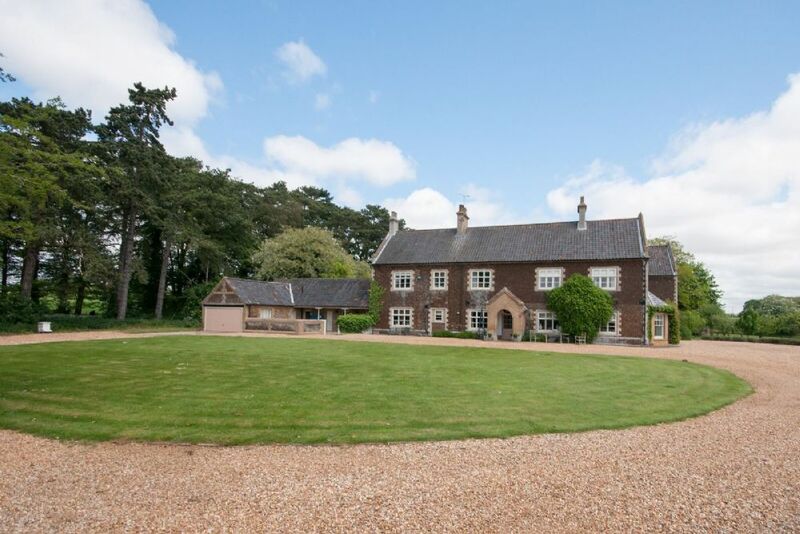 It is ideally located only two miles from Sandringham House and a short drive to the beautiful North Norfolk coast. Guests are advised that the house has free wifi in the kitchen, dining room and TV room. Entrance hall with sweeping staircase. Cloakroom: has a wash basin and a separate loo. Drawing Room: charming room with an open fire place and full height windows overlooking the gardens. Tastefully furnished with two huge comy sofas, two armchairs, large dresser and well-stocked bookshelves. Games Room: perfect for the young to escape to with a pool table, two sofas, bean-bags, bureau, TV, lots of books and games. There are French doors to the garden. Snug Sitting Room: relaxed room with a big wood burning stove, comfy L- shaped sofa, sofa, trunk coffee table, large free view digital TV, DVD player. There's a door that leads through to the back lobby area and out to the garden. Kitchen: well-equipped country kitchen with an Everhot electric range cooker and separate electric oven and hob and fridge. Gorgeous open views looking down the private drive from the double Belfast kitchen sink. There's a kitchen table and 4 chairs, lovely original butcher's block and a huge pantry. Leads through into the dining room. Dining room: lovely light and airy room with full height windows on two sides overlooking the grounds. There's a large dining table with 10 chairs and plenty of space to add the matching kitchen table to seat up to 14 guests. Attractive ornamental fireplace and large dresser. Back lobby: with access to the terrace near the swimming pool and has a useful second small kitchen: with second dishwasher, fridge/freezer, Belfast sink and cupboards well-stocked with crockery and glasses for use in the garden. From the ground floor there are two staircases: there is a door along the hallway to a second smaller staircase to the first floor, as well as the main sweeping staircase. All of the bedrooms are generously proportioned with high ceilings and lovely uninterrupted views across the grounds, with no other properties within sight. Bedroom 1: a wonderful spacious bedroom with lovely views from its large windows across open countryside. There's a super king-size bed, bedside tables and lamps, two chests of drawers, large wardrobe, armchair, sofa, TV, free-standing full-length mirror and a built-in cupboard. Bathroom 1 : bath with mixer taps, hand basin and WC. Bedroom 6: this is the smallest bedroom,overlooking the swimming pool, which is more suitable for sleeping up to three children with a double bed and two single beds and a chest of drawers. It is near to bedroom 1. Bedroom 2: lovely large family room with a double bed and a single bed, small shelved cupboard, bedside tables and lamps, armchair. There's a door through to bathroom 2. Bedroom 3: lovely views across the front drive with a double bed, bedside tables and lamps, built-in wardrobes and a sofa. Bedroom 4: large room with views across the drive with a super king-size bed, and a separate sleigh bed, bedside tables and lamps. There is a chest of drawers for this bedroom in the corridor. This bedroom has its own en-suite bathroom: Victorian claw foot bath with shower mixer taps, hand basin, chair and WC. Bedroom 5: at the end of the landing this is another attractive room with a king-size bed, bedside tables and lamps, chest of drawers, TV, wardrobe. Shower room: contemporary large walk-in shower, hand basin, heated towel rail (next to bedroom 5). Separate WC at the far end of the landing. Flitcham Hall is accessed via a long private driveway (approximately half a mile long) off the Sandringham Road with a large shingled parking area with plenty of room for parking. The attractive grounds surrounding the hall are well-maintained and include a terrace with outside furniture and plenty of lawned areas for children to play.These glorious grounds are enclosed and not overlooked by any other properties - the nearest neighbours are the horses grazing in the adjacent paddocks! This is a lovely quiet place to sit and enjoy the feeling of complete privacy. Swimming Pool: this is surrounded by a picket fence and is heated to 28 degrees from 9am - 6pm during the summer months. Tennis Court: there is a hard tennis court which is fully fenced. Guests are asked to bring their own rackets and balls if they wish to play. It is only a few minutes drive to Sandringham House and Gardens and 10 minutes to renowned pubs such as The Crown at East Rudham or The Dabbling Duck at Massingham. The acclaimed Hoste Arms in the charming village of Burnham Market is within 20 minutes drive away. The beautiful Norfolk coast is approximately 12 miles away and easily reached by car. Electric cars are not permitted to be charged on the premises.